Heat oven to 350°F. Grease and flour 9-inch round cake pan or 8-inch square pan. In large bowl, beat Bisquick mix, granulated sugar, 1/2 cup milk, shortening, vanilla and egg with electric mixer on low speed 30 seconds, scraping bowl constantly. Beat on medium speed 4 minutes, scraping bowl occasionally. Pour into pan. In small bowl, mix coconut, brown sugar, nuts, butter and 2 tablespoons milk. Spread topping over cake. Set oven control to broil. Broil about 3 inches from heat about 3 minutes or until golden brown. Add a handful of chocolate chips or butterscotch chips to the topping for a decadent finish. For the cake, you can use 2 tablespoons butter or margarine, softened, instead of the shortening. If you’re chopping nuts in a food processor, use quick pulses to avoid an oily mess. Go ahead and chop more nuts than you need. Wrap and freeze the extra nuts to use later. You can also bake this most-requested cake in a 9-inch square pan for 25 to 30 minutes. I also like to make cupcakes out of these for small handles to hold and eat. 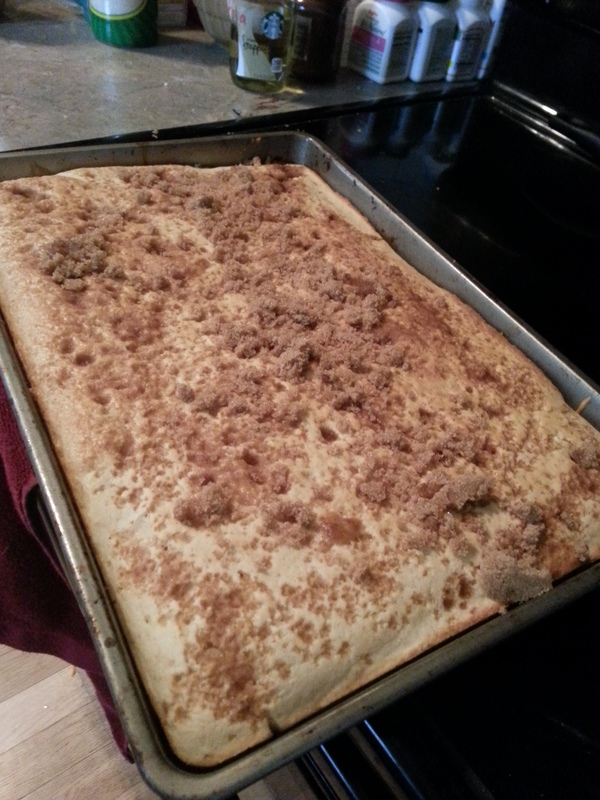 Comes out nice and fluffy in a long but slight ridge pan. Enjoy your cake with tea, coffee, milk or whatever you choose. 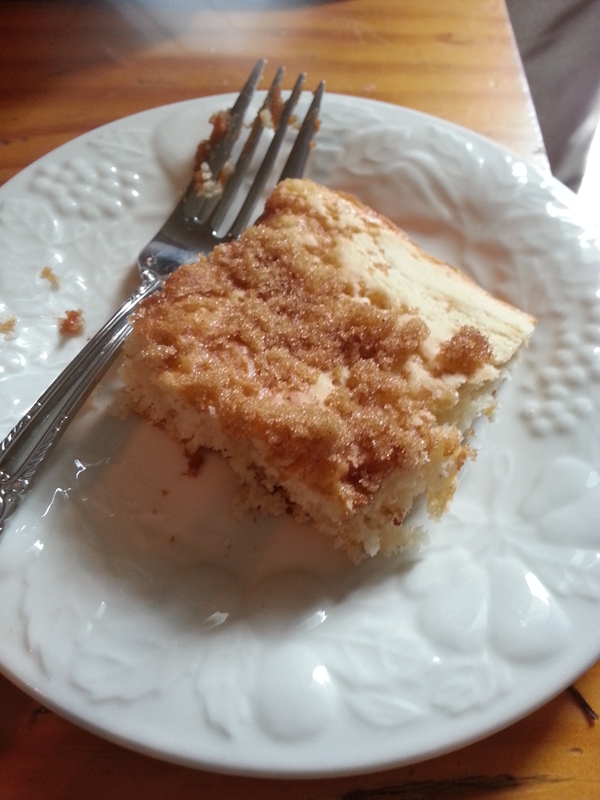 I have many friends who don’t drink coffee so I quit calling it Coffee Cake and started calling it Crumb Cake now. Either way, It is yummy and easy to make. I actually met Trisha Trixie online and became quite fascinated by her. She is like a magnet that draws you in. From the colorful designs to the outlandish posts you really get hooked. One thing that really resonated with me is her new use of old materials. Ingenious! I love that she is creative but more that she cares about this earth and wants to do her part to keep it beautiful. All while glamming you up! 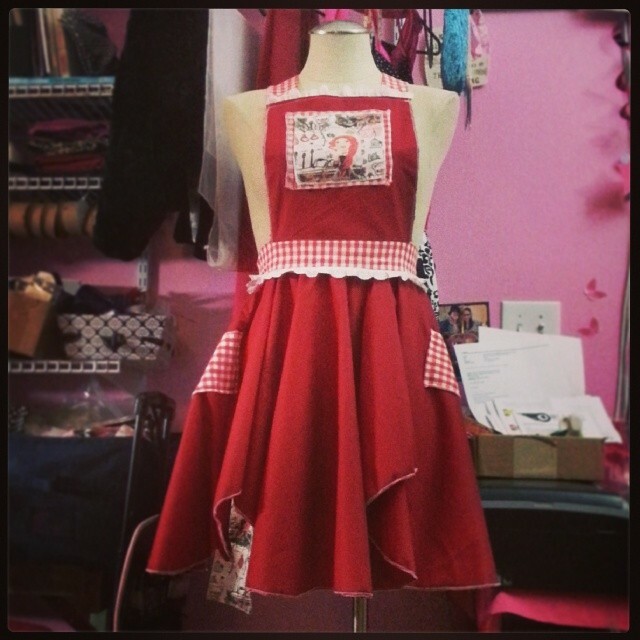 Trisha gifted me with a gorgeous apron just as a way to say hello. I was surprised to find out that most of the apron was a former bed sheet. Right on! I’m sure if my new apron could speak it would have some great tales to tell. I like that! I adore that it is made by a local artisan who has put her heart and soul into it. This apron is not some meaningless object that spent most of its life in a cargo container. Talk about dead energy. I appreciate thoughtfully handmade things. I feel good supporting artisans and designers. Maybe just maybe my purchase with be the encouragement they need to create the next epic thing!